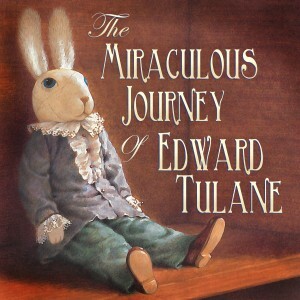 The Miraculous Journey of Edward Tulane by Kate DiCamillo is for readers young and old. Life changes can be hard to accept at times. As humans, we underappreciate the value of looking outside of self and being present for whatever experience life puts before us. 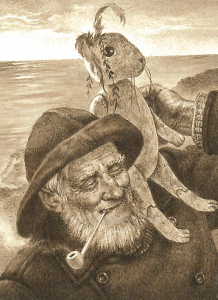 To think that adults might be inspired to treasure deeper connections with all people by a toy rabbit is a strange idea. But, in THE MIRACULOUS JOURNEY OF EDWARD TULANE, we are all reminded that being present and supportive of others is sometimes the path to the life of our dreams. Georgiana Shelekov is the VP of Education on DCT’s Board of Directors. She told us about her fond memories of reading the book with her children when they were in elementary school. The author, Kate DiCamillo, writes about emotional issues without underestimating her audience—mature feelings are dealt with in a straightforward manner that all children, and adults, can understand. Relatively speaking, that’s a rarity in books for children this age. Descriptions of people who come and go in Edward’s life are concise, yet evocative and complete. Both the reader and Edward come to see the power of hope and love in the world. Edward’s journey, in many ways, mirrors the growth of our children and youth as they go through their evolution. I spent most of the night trying not to cry. For me, the core of what good theater is, is a well-written and emotionally compelling story. The reading was a good way to introduce a newer children’s story to those who wouldn’t know it. June Dales, special guest of THE MIRACULOUS JOURNEY OF EDWARD TULANE director Artie Olaisen, first read the book to her children nine years ago, and it immediately became her favorite book of all time. 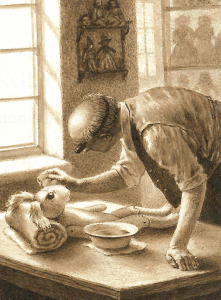 It’s funny how reading a book about a toy rabbit touched me emotionally in so many different ways. Edward started his life sitting in front of a mirror, admiring himself with no margin for other people. And life seems so focused on a ‘me, me, me’ attitude these days. This book really teaches that you have to be present. And honestly, sometimes you must force yourself to be open to change. 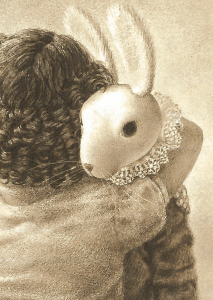 Both the play and the book about Edward Tulane are full of hope and truth about life. Through book author Kate DiCamillo and playwright Dwayne Hartford’s words, both kids and adults are able to look at their lives the same way Edward did; by realizing that sometimes you have to hit bottom in life before you can get better. Embarking on your own miraculous journey begins at DCT! Join us for a performance of THE MIRACULOUS JOURNEY OF EDWARD TULANE, running until April 10. Reserve tickets by calling the Box Office at 214-740-0051 or visit dct.org. You can find out more about Bagram Ibatoulline at the Candlewick Press website, https://www.candlewick.com. Illustrations copyright © 2006 Bagram Ibatoulline.